This is part of the Norman Rockwell integration blog series. To gain access to all the blogs in this series, click the tag “Norman Rockwell”. You are encouraged to try out these activities and to comment on the blogs, activities and ideas. You might even find that you can share other ways to integrate Rockwell into what you do! Your voice and ideas matter! Drawing conclusions, making inference, these are difficult skills for students.Here is one way to approach the learning and practicing of it with the paintings of Norman Rockwell. 1.Have students look closely at the painting and allow for some time for first impressions and conversations about the characters and the situation. What do you know about this situation by looking at the painting? Let’s list some facts found in this painting. What are some details you notice in this picture? Out of our list/brainstorm of observations, what facts can we group together to help us form a valid opinion about this painting? 3.Write three facts and/or details in a graphic organizer like the one on the worksheet and discuss what conclusion you might draw about the painting.Then explain that this opinion you have formed is your conclusion.It is not something that was found directly in the painting, but is your own opinion that can be supported by the details in the painting. 4.After a short introduction to the activity, invite students to work in small groups or on their own with a new painting. You may want students to complete the WORKSHEET. Give students a copy to use in small groups. Place copies of paintings around the room and have students do the activity while traveling from piece to piece in an “around the world” format. Do a shared lesson or activity with your whole class or with a small group. Create a center in your room where students can visit and complete the activity. Arrange the paintings around the room and ask students to find two paintings to use to draw conclusions.Students will roam the room, locating two paintings they enjoy.Once they do, they write down the title of the piece and complete one half of the worksheet.Then they continue to the next painting. If students are using different paintings, have them write their conclusion on a strip of paper.Display all the paintings, have the student or group state their conclusion and ask the other students to match the conclusion to the painting. Don’t reveal the title of the pieces beforehand.Instead, number the pictures and have the students do the activity.Then, ask students to use their conclusions to help them come up with a title for the painting.Share and then compare their titles to the ones Rockwell gave.Ask: How did your conclusions help you to come up with a title? 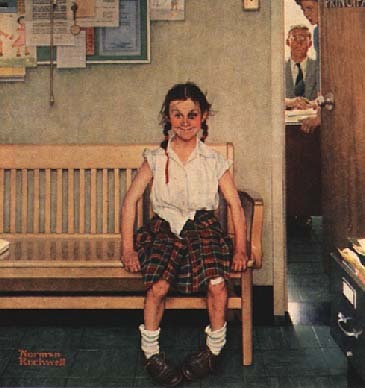 How does your title compare to the one Rockwell gave? Make a Comment – We want to hear from you. What do you think of this activity? Any extension or variation ideas? Comments are welcomed and encouraged. There is so much you can do with a Norman Rockwell painting (or other well selected painting or photo) that directly relates to many reading skills. 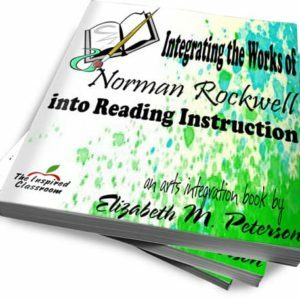 My ebook, Integrating the Works of Norman Rockwell into Reading Instruction explains many of them from deciphering fact and opinion to making predictions. Why Practice Reading Skills Away from Reading?